Recently, digital-image-correlation techniques have been used to accurately determine two-dimensional in-plane displacements and strains. An extension of the two-dimensional method to the acquisition of accurate, three-dimensional surfacedisplacement data from a stereo pair of CCD cameras is presented in this paper. A pin-hole camera model is used to express the transformation relating three-dimensional world coordinates to two-dimensional computer-image coordinates by the use of camera extrinsic and intrinsic parameters. Accurate camera model parameters are obtained for each camera independently by (a) using several points which have three-dimensional world coordinates that are accurate within 0.001 mm and (b) using two-dimensional image-correlation methods that are accurate to within 0.05 pixels to obtain the computer-image coordinates of various object positions. A nonlinear, least-squares method is used to select the optimal camera parameters such that the deviations between the measured and estimated image positions are minimized. Using multiple orientations of the cameras, the accuracy of the methodology is tested by performing translation tests. Using theoretical error estimates, error analyses are presented. To verify the methodology for actual tests both the displacement field for a cantilever beam and also the surface, three-dimensional displacement and strain fields for a 304L stainless-steel compact-tension specimen were experimentally obtained using stereo vision. Results indicate that the three-dimensional measurement methodology, when combined with two-dimensional digital correlation for subpixel accuracy, is a viable tool for the accurate measurement of surface displacements and strains. 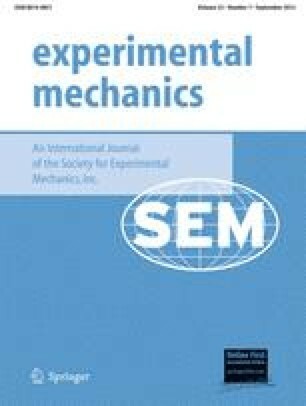 Paper was presented at the 1989 SEM Spring Conference on Experimental Mechanics held in Cambridge, MA on May 29–June 1.